WIW - Should I keep this jacket? Had a great time in the city last week! 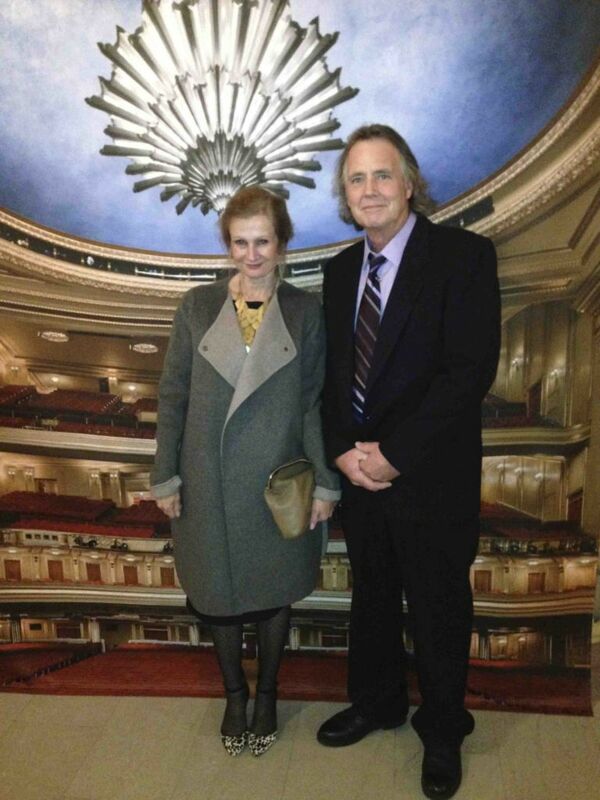 Picture 1 -- at the San Francisco Opera to see the Barber of Seville with my boyfriend. I bought him this lavender shirt, he had the tie. I love this color on him. (Yes that's THE coat from Vince -- shoes are Enzos from NAS.) Looking at this picture I think a structured clutch is a wardrobe hole. Picture 2 -- Zara dress worn to opera. I got this in LA at the Angie meet-up in September. I've already worn the same dress to the opera twice. No one looked askance. Picture 3 -- Walking about Hayes Valley. I had wanted a full big scarf look based on Angie's post, but from the picture you can see it fell apart. Everything here is from last year or older. Leather jacket is one of my favorite pieces ever (Zara). Jeans -- R13 cross overs. Cream Henley from Daftbird. And my all-time favorite Western style booties from Vintage Shoe Company. They stopped making them, wah. Thanks for looking and commenting. And if you have any scarf-taming tricks please do share. 1 -- What do you think about this BR stretch wool blazer? Today made casual with boyfriend jeans and a white tee. 2 -- Here is the same blazer worn to a Food Show on Tuesday. In hindsight a non-faded pair of pants would have worked better. As you can see the sleeves are rather long. 3 -- Back to today, I switched into my FP navy sweater instead of the blazer in #1, I think navy is better on me. 4 -- But I was still uncertain so I later switched into my grey skinnies as the boyfriend jeans seemed a little stumpifying even with the tall booties. Not sure which version I liked better! Disadvantaged lighting in #4. 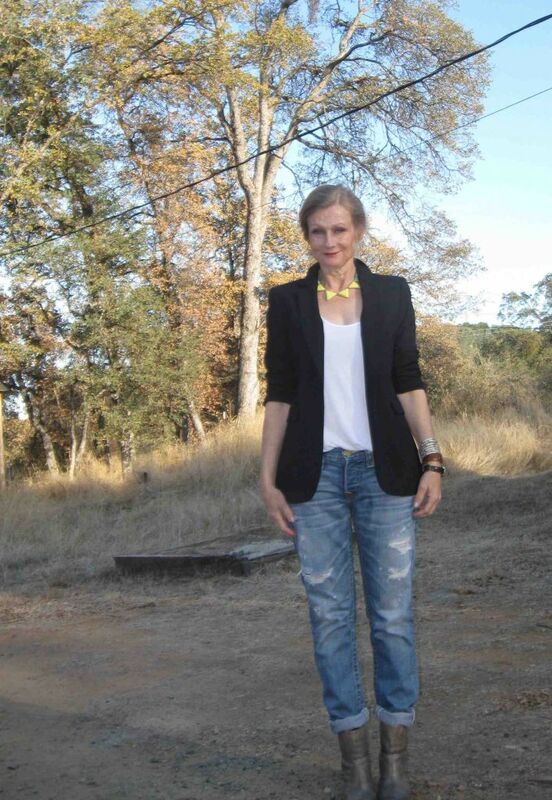 So -- back to the question, is the blazer a Yay or a Nay? Thank you!! I wore this on Wednesday to eat Japanese food and do some local shopping with my guy. I realized this is a go-to look for me (and probably lots of other women) and I haven't changed it for some time. 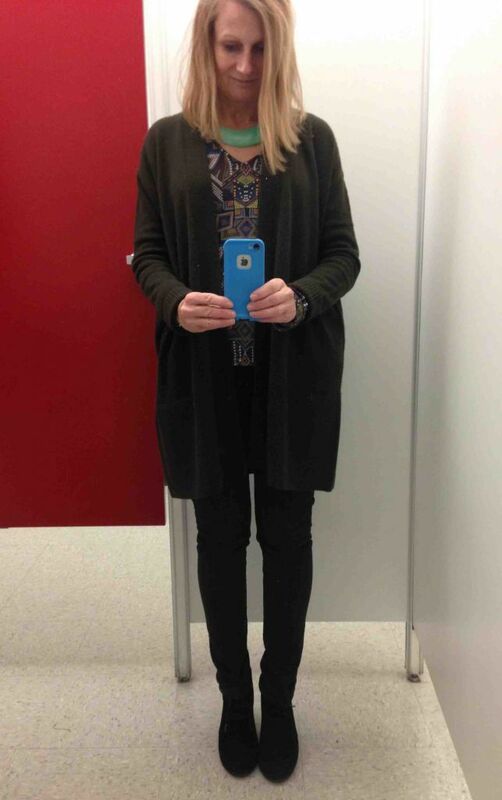 I think I am mentally ready to change things up, but am also feeling content right here and not sure where I want to go next as I seem to keep buying things with the same look (my recent cardigan k/r thread). Sweater from last year -- Vince. It is horribly pilled! I will never buy another 70 wool 30 cashmere sweater again. I have cheap cashmere that cost me 25% of this and it looks much better, but I do like the cut of this cardigan and it matches the jeans really well. This is a deep brownish-green that reads as almost black but is a nice color on me (although you can't tell from the photo). The only thing that is from this year is the iPhone. With one of those pricey but not chic Lifeproof waterproof cases. Picture #2 -- this jacket came home with me from TJs. It's from Young, Fabulous and Broke. For the Middle-aged, Content but less-Broke me. What do you think? Very wearable and my boyfriend liked it but I'm not sure it's taking me anywhere exciting. ETA -- the necklace is new! I forgot. From Kenneth Jay Lane, I like the pretty color it delivers near my face. I got this fox sweater on the cheap at Old Navy. It called to me because of a childhood nickname, kind of silly and I shall spare you the details. ;-) I like the camel color, which I am starting to learn is a good neutral on me. And in picture 2 you are seeing a rare work outfit. Parsley recently posted an outfit with a longer blazer and wondered if that jacket style was still relevant. My advice was to pair it with trendy items. Well I have ignored my own advice and here you see me wearing a trio of pieces around 3 years old. My thinking was that, as I was unsure about these pieces, I could try demoting them to my work capsule. Yes my work wardrobe contains demoted pieces because they get stained being a server. I do not feel comfortable wearing valuable or new things at least. I am happy with how this turned out, clogs, apron and all. Happy to have a different look (it is so slow now I am less concerned about looking the food service professional). Although I've moved onto different looks for my non-work outfits, I am happy to give these older pieces one last bit of life. Thanks for looking and commenting. What about you, do you demote?